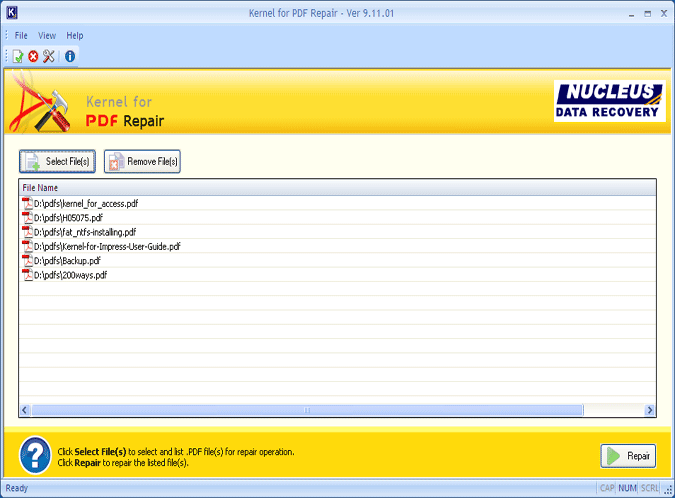 UDM Downloads > Kenel For PDF Repair Tool! Kernel for PDF is the excellent PDF repair tool to deal with unforeseen PDF file corruption situations. Repairing n numbers of PDF file is just few minutes affair with PDF repair tool, as it repairs multiple PDF files in one repair cycle. It recovers all data contained in the corrupt PDF file including internal cross-link tables, embedded fonts, meta data, text, images, tables and hyperlinks. Once the corrupt PDF file is repaired and data is recovered from it, it gets saved at the location defined by the user. All errors that usually occur during opening, uploading, downloading saving or printing any PDF file are efficiently handled with PDF repair tool. Kernel for PDF repair supports all versions of Acrobat PDF file for repair and data recovery. Free demo version of the software is also available to experience its excellence and efficiency before making the purchase. The demo version repairs the corrupt PDF file, recovers data from it and displays preview of recovered data for alternate pages of the PDF file. Rest of the pages of the PDF file are left blank in place of the content. To recover complete data from the corrupt PDF file, full version is required to be purchased by the user.